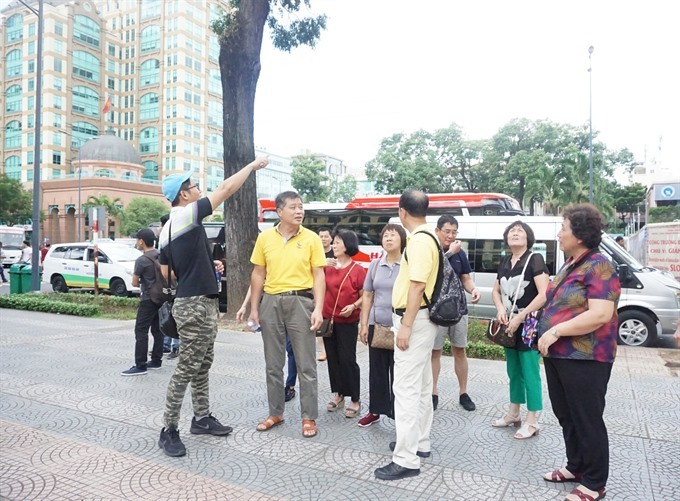 Given the boom in the number of Chinese tourists in HCM City, authorities have been urged to take preventive measures against the so-called “zero-đồng” tours that cater to these tourists and adversely affect tourism revenue. Since last year, the number of tourists from China has surpassed those from Japan and the US, according to the city’s Tourism Department. Around 600,000 Chinese tourists visited last year, 200,000 more compared to the previous year. In the first five months of the year, the city welcomed 3.2 million foreign arrivals compared to 2.5 million in the same period last year. Of the total, the number of Chinese tourists was 266,200, up 22.5 per cent year-on-year, said Nguyễn Việt Anh, head of the Department’s Travel Management Division. Northeast Asia, including mainland China, Japan, South Korea and Taiwan, is expected to be the priority market for the city’s tourism sector in upcoming years, he said. The department has targeted tripling the number of Chinese arrivals in two years to around 1.5 million. However, tourism experts warn that the growing influx of Chinese tourists could affect the quality of tourism services, particularly the continued existence of zero-đồng tours. Popular destinations in the northern province of Quảng Ninh, the central coastal provinces of Khánh Hoà and the city of Đà Nẵng are often filled with Chinese tourists on budget tours. Cheap tour packages are aimed at budget Chinese tourists, with overseas tour agencies taking no fee for air tickets and accommodations, and then pressuring visitors into purchasing products or services when they are on tour, according to Từ Quý Thành, director of Liên Bang Travelink, which specialises in Chinese-speaking markets. Some companies in Việt Nam, who operate in association with their overseas counterparts, run zero-đồng package tours, Thành said. Visitors on these budget tours have to follow the agencies’ itinerary of tourist attractions, restaurants and shopping sites where they are often overcharged for products and services, he said. Most Vietnamese travel agents based in HCM City understand the Chinese market well and have rich experience in tour operation and management. They refuse to take part in these zero-đồng tours, Thành said. Nguyễn Thị Khánh, deputy chairwoman of the city’s Tourism Association, said members of her association were not offering zero-đồng tours. Travel firms in HCM City are focusing instead on high-spending Chinese tourists. Trần Thị Bảo Thu, marketing and communications director of Fiditour, said that reaching 1.5 million Chinese tourists by 2020 was achievable, but a more important requirement would be to increase spending per visitor. Chinese visitors to HCM City, who are mostly are in the 25-50 age group and from large cities, spend a lot on leisure travel and shopping. Tourism authorities should also monitor cheap tour packages to ensure that quality is not being compromised, and impose severe penalties on operators offering zero-đồng tours, she added. The city also lacks sophisticated and well-organised cultural and arts shows as well as services and entertainment activities at night, Thành said. “The shows and night entertainment are not that appealing,” he said. Even river tours along the Sài Gòn River and Nhiêu Lộc-Thị Nghè Canal have failed to attract high-end tourists, he added. Chinese tourists like to buy farm produce and arts and crafts, but find it difficult to purchase them in bulk because there is a lack of freight service at wholesale markets. 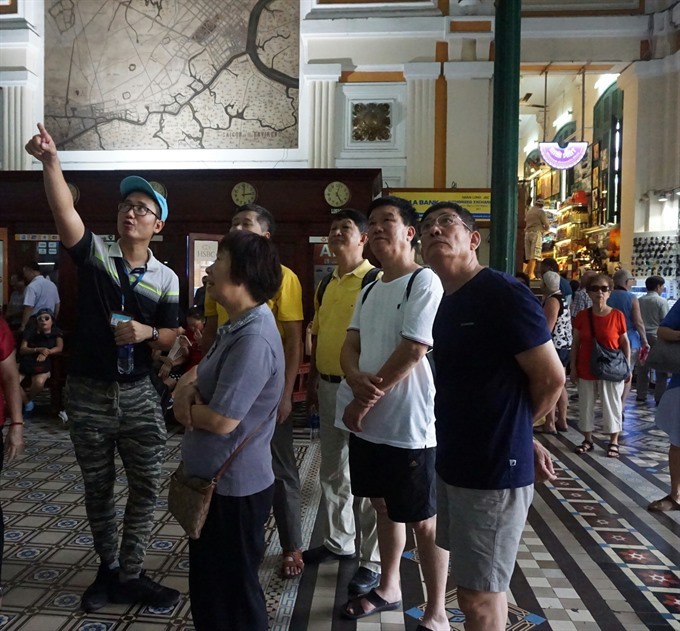 “With the rapid increase in Chinese tourists, the city faces a severe shortage of Chinese-speaking tour guides and human resources in tourism,” said Hồ Văn Tường, a lecturer at the Sài Gòn Tourism Vocational College. Most tourism vocational schools offer English-language courses, but no schools offer Chinese-language courses. “There is a huge gap in tourism training,” Tường said. Most of the Chinese-speaking tourism workforce, including tour guides, are ethnic Hoa (Vietnamese of Chinese origin) from HCM City and other provinces. The shortage of Chinese-speaking tour guides also leaves an opening for illegal Chinese tour guides to work in Việt Nam. To address the shortage, tourism training schools should offer more Chinese-language courses, Tường said. The Department of Tourism should also inform tourism schools of its policy to attract more Chinese tourists so that schools proactively develop their curriculum to suit future needs, he added. Foreign tourist spending in the city is an average of VNĐ3.3 million (US$145) a day, according to the Department of Tourism. Bùi Tá Hoàng Vũ, direct of the department, said the city is calling for investment in shopping complexes with authentic, made-in-Việt Nam products to encourage tourist spending. HCM City’s hotel market, especially the luxury segment, expects to attract more investors due to strong growth in tourist arrivals, according to Vũ. With annual growth of 20 per cent in the nummer of tourists, the city needs around 10,000 luxury hotel rooms to serve around 10 million foreign visitors by 2020.